Joining NETGEAR’s family of Smart Switches with simple switch management at no extra cost, this 1U high, 48-port Gigabit switch maximizes bandwidth and density for great value and capability. 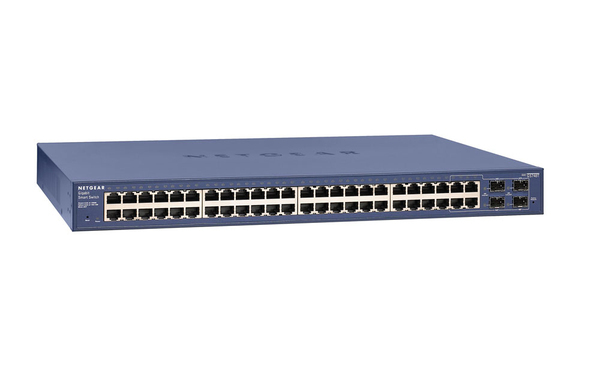 With 48 10/100/1000 Mbps ports, each capable of powering 2000 Mbps of data throughput in full-duplex mode, plus four optional fiber ports, it provides a 96 Gbps backbone and connects servers or power users, delivering large amounts of multimedia, image, and video information in no time at all. Standards-based, it is ideal for combining 10, 100, and 1000 Mbps devices, as it delivers automatic speed and full/half-duplex sensing plus Auto Uplink™ on every port. Four hot-swappable small form-factor pluggable (SFP)** GBIC slots provide optional fiber connectivity for greater distance. An intuitive, Web-browser interface offers simple switch management, making it a snap to monitor switch performance, configure ports, even setup trunks, VLANs, and prioritization. 48 10/100/1000 Mbps ports deliver full-speed packet forwarding in a 1U size to migrate your network to future-proof functionality. Four SFP GBIC fiber slots provide optional fiber connectivity for greater distance. Smart Switch capability enables key management features for the value price of an unmanaged switch. Included are performance monitoring, port configuration, VLAN for traffic control, port trunking for increased bandwidth, and Class of Service (CoS) for traffic prioritization. Simple to set up and simple to use for effortless network monitoring and troubleshooting. Made to last, this sturdy switch is housed in a 17-inch metal box and comes with a rack-mounting kit.